Dark matter in the sun may help scientists solve a long-standing mystery about our closest star. 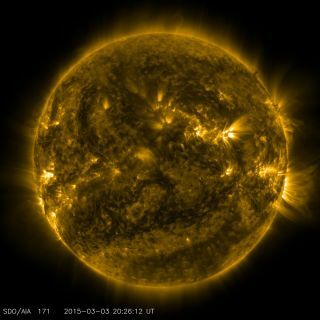 Here, NASA's Solar Dynamics Observatory captures a recent view of the sun. The mystery has to do with a seeming discrepancy in the composition of the sun, which experiencessound waves that zip around inside it and cause tiny rhythmic fluctuations in its brightness. By studying this flickering, scientists can better understand its composition and internal activity. This scientific field — known as helioseismology when it refers to the study of the sun, and asteroseismology when it refers to that of stars — is akin to seismology on Earth, which helps geologists yield insights into the innards of this planet. Elements in the sun heavier than hydrogen and helium influence how sound waves travel within the star. This means that, in principle, helioseismology can measure the abundance of each element with extremely high accuracy, said lead study author Aaron Vincent, an astroparticle physicist at Durham University in England. Another way scientists can measure the abundance of each element in stars is by looking at their light, as each element gives off a unique fingerprint or spectrum of light. A decade or so ago, scientists discovered that light from the sun suggested that it had about 20 to 25 percent less carbon, nitrogen and oxygen than scientists had previously thought — a finding that contradicted what helioseismology had suggested. Existing models of the sun could not explain this discrepancy — a mystery that scientists call the solar abundance problem, Vincent said. "Despite a decade of effort, this is a puzzle that has yet to be solved," Vincent said. "So far, no attempt to modify solar models to account for this discrepancy has really worked, which is what has prompted particle physicists to look for a more exotic explanation." Now, Vincent and his colleagues suggest that this solar mystery could be solved by dark matter, which in and of itself is one of the greatest mysteries in science. In 2011, Vincent was investigating ways in which dark matter might interact with other particles, when co-author Pat Scott, a researcher at Imperial College London, introduced him to the solar abundance problem. Vincent thought dark matter "could be an interesting solution to the problem," Vincent recalled. The scientists ran thousands of simulations, looking at many different models of how dark matter might interact with the sun. They discovered a possible explanation for the solar abundance problem: A model suggested that dark matter is asymmetric, meaning one kind of dark-matter particle is more abundant than its antiparticle counterpart. Normal matter is asymmetric as well — for instance, there are far more protons than antiprotons in the universe. "I think the most interesting aspect of this work is the potential link between two puzzles," Vincent said. On the one hand, there is the solar abundance problem, "which hints at a missing ingredient in our understanding of the sun, and on the other hand, this could be the very first hint about the particle nature of dark matter itself," he said. "It's exciting to think that we're looking at a link between such seemingly disconnected areas of physics." The specific kind of asymmetric dark-matter particle that Vincent and his colleagues examined had a special property: The greater its momentum, the more likely it was that it would interact with other, normal particles. This finding suggests that "collisions that transfer more energy are more likely, and collisions that transfer less energy are suppressed," Vincent said. The asymmetric-dark-matter model differs from those suggesting that dark-matter particles are their own antiparticles, and thus annihilate themselves when they make contact with one another. "The main advantage of asymmetric dark matter is that a lot of it can accumulate in the sun as it speeds through the dark-matter cloud that engulfs the Milky Way," Vincent said. "If the dark matter was self-annihilating, the dark matter would disappear before transporting any sizable amount of heat from the sun's core." If this asymmetricdark matter really does exist, "we should be on the cusp of seeing it very soon," Vincent said. He noted that it may be seen by next-generation dark-matter-detection experiments, such as SuperCDMS, located deep underground in the Soudan Mine in northern Minnesota, as well as during the next run of the Large Hadron Collider, the most powerful atom smasher in the world. Vincent, Scott and their colleague Aldo Serenelli, of Spain's Institute of Space Sciences in Bellaterra,will detail their findings in a paper accepted for publication in the journal Physical Review Letters.